I get really overwhelmed by large pieces of meat but I find a slow cooker makes the task a bit easier. Pork shoulder is that cut of meat that requires slow long cooking to get it tender and keep it moist. 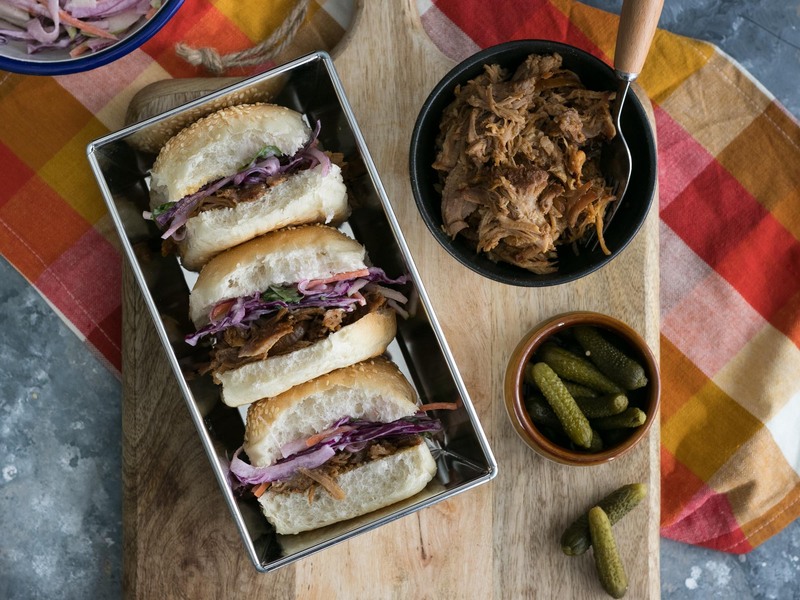 This pulled pork recipe doesn’t feature any bbq sauce and gets all it’s flavour from mixture of spices that you rub into the meat before it goes in the slow cooker. I created this recipe as part of the collection of recipes for the Barker’s Pantry website. It uses the Barker’s New Zealand Apricot Jam which means you don’t need to add any extra sugar to the dry rub. Once the meat is ready, you can taste the cooking liquid and if it’s too sweet you can add a little extra apple cider vinegar or even a spoonful of mustard. The pulled pork is sweet and tangy and goes really well with a coleslaw that has some thinly sliced green apple in it. If you start this before you go to work, dinner will be ready by the time you come home. Mix chicken stock, apple cider vinegar and Barker’s New Zealand Apricot Jam in a bowl. In another bowl mix the cayenne pepper, salt, pepper, cumin, garlic powder, mustard powder and paprika to make the dry rub. Pour half of the chicken stock mixture into the slow cooker and scatter the onions over the bottom. Rub the dry rub all over the pork and sit the pork on top of the onions. Pour the rest of the chicken stock mixture over the pork. Set the slow cooker on LOW and cook for 8-9 hours or till the pork meat easily pulls apart with a fork. Towards the last hour, I like to turn the pork over so the top part sits in the liquid. Remove the meat from the slow cooker and using two forks, shred the meat. Spoon the liquid from the slow cooker over the meat till it’s all submerged. This will keep the meat moist. Pulled pork can be served in bread rolls with coleslaw or even on rice as a one bowl meal.